George Hill (in graduation gown, center), has been incarcerated 27 years for shooting a cop in 1991. 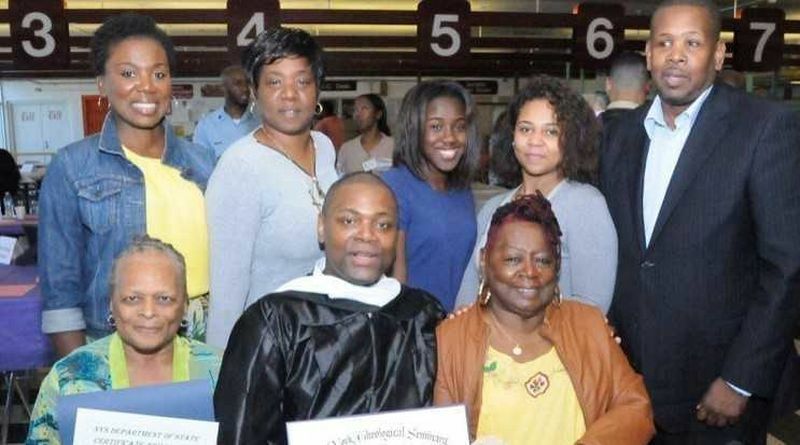 A man imprisoned for 27 years for shooting a cop in Brooklyn should be released because he's earned three college degrees while behind bars and mentors other prisoners in his role as a law library clerk, his lawyers said Monday. George Hill — who even has a master’s degree from the New York Theological Seminary — has been severely punished for shooting Officer Paul Freitas in 1991 and is a changed man who deserves his freedom, they said. "If you meet Mr. Hill, you will find a remorseful, thoughtful, deeply compassionate man," said Steven Zeidman, a CUNY law professor representing Hill. As the Daily News reported Sunday, Freitas and the Patrolmen's Benevolent Association are pressing the state Parole Board not to release Hill. The 46-year-old prisoner, now housed in Sing Sing, is slated to give his statement to the Parole Board Tuesday. But Zeidman and his colleague Bahar Ansari argue that Hill shouldn't be seen as he was — a troubled 19-year-old gunman — but as the “changed and transformed” person he is today. "The question ultimately is are they focusing on who he is now, or what happened 27 years ago?" Zeidman said. "Fixating on what happened 27 years ago is cruel and unforgiving. He can’t change what happened 27 years ago. He can change who he is today. He has improved and atoned and changed and transformed." The retired officer told The News Sunday he fears there's a very real chance that Hill will be released after his fifth appearance before the board. "To this day, I have heavy stomach pain, and I still have flashbacks all the time. I still have bullet fragments in my face,” he said. Freitas noted that he did receive a letter of apology in November from Hill, but he dismissed it as self-serving. "It was a canned letter just written for him to get out of jail," he said. "In 25 years, he didn't apologize. He could have apologized any time he wanted, but he didn't." But Zeidman and Ansari said Hill didn’t know he was allowed to write to the victim of a crime until last year. Once Hill learned he could have sent an apology, he did so immediately and sent two letters, they said. He has deep ties in the community, including his 82-year-old mother and a brother who is a retired correction officer.